Just a decade ago, experimental work by Guerrier, Flayeux, and Boschetti demonstrated the ability of sodium chloride (NaCl) gradients on hydroxyapatite (HA) to remove aggregates from IgG preparations. This approach has since proven effective with the majority of IgG monoclonal antibodies and become the foundation of HA’s growing popularity. The “International Conference on Hydroxyapatite,” held late last year in Rottach-Egern, Germany, underlined HA’s emergence as a mature industrial technology, its expansion into new application areas, and its continuing fascination to investigators worldwide. Participants presented new findings on purification of therapeutic proteins, viral vaccines, characterization of biomolecule interactions with HA, and development of new HA materials. HA is a multimodal chromatography support. In contrast to ion exchangers, for example, which principally exploit biomolecule interactions with a single type of chemical surface, HA exploits two primary binding mechanisms: metal affinity interactions through HA calcium and cation exchange interactions through HA phosphate. Protein carboxyl residues bind by calcium affinity, amino residues bind by cation exchange. Calcium interactions can be eluted only by ions with high calcium affinity, like phosphate. Cation exchange interactions can be eluted with any salt. Steve Cramer, professor at Rensselaer Polytechnic Institute, presented results from high-throughput screening experiments and sophisticated modeling programs. Data from a broad panel of model proteins over a wide range of conditions emphasized that positively and negatively charged sites on a given protein are able to bind their complementary chemical surfaces on HA simultaneously. This cannot occur on ion exchangers and accounts for the unique selectivity of HA. Dr. Cramer also said that, although HA calcium carries a positive charge, NMR studies indicate that anion exchange interactions do not contribute to retention on HA. Ruth Freitag, professor at the University of Bayreuth, Germany, is working to obtain a more refined understanding of how IgG and its fragments interact with the surface of HA. Experimental data and 3-D computer models revealed how a small region of a protein can dominate its overall interaction with the solid phase. Protein isoelectric point was not a useful predictor of retention behavior, she reported. Dr. Freitag also talked about HA’s well-known historical ability to achieve separations impossible for other methods and provided several new examples. Shuichi Yamamoto, professor at Yamaguchi University, addressed a different model system for characterizing HA interactions: DNA. Polynucleotide phosphates form NaCl-resistant coordination bonds with HA calcium but are electrostatically repelled from HA phosphate. NaCl increases retention by suppressing charge repulsion, allowing the DNA to bind with more HA calcium sites. HA easily separates single- and double-stranded DNA and discriminates among DNA molecules according to size. This is a substantial benefit over anion exchange chromatography, which supports virtually no discrimination regardless of DNA size or the number of strands. Previous work has shown that HA binds RNA less strongly than DNA. These results highlight the unique utility of HA for DNA plasmid purification. Alois Jungbauer, professor at the University of Natural Resources and Applied Life Sciences, presented confirmational data. The results illustrated a striking case of preferential orientation, with plasmid DNA binding by the terminus of a roughly linear section and extending out from the HA surface like the bristles of a brush. Giorgio Carta, professor at the University of Virginia, addressed another aspect of HA surface chemistry. Like all chromatography media possessing a cation exchange functionality, pH descends on HA columns when NaCl is introduced. This results from displacement of hydronium ions from the media surface by sodium ions due to their higher affinity for the cation exchange groups. With HA, the phenomenon also involves the calcium-phosphate equilibrium of HA itself, which has important ramifications for column lifetime. HA elution with NaCl gradients has been documented to reduce aggregate levels in IgG preparations from as high as 60% down to less than 0.1% in a single step at industrial scale. This application has become increasingly valuable as aggregate levels have risen along with cell-culture productivity. In parallel, HA achieves 1–2 logs reduction for leached protein A and host cell proteins, 3–4 logs DNA reduction, 4–5 logs endotoxin reduction, and upwards of 4 logs virus reduction. Alexander Eon-Duval, biotechnology production director at Merck Serono, showed that HA is also effective for aggregate removal from Fc-fusion proteins. Validated Biosystems showcased results from a minibody purification process developed in collaboration with the City of Hope Hospital. Aggregates were not a problem in either case but HA proved to be uniquely capable of removing a population of nonreactive dimers. Frank Hensel, vp of R&D at Patrys, was able to demonstrate HA-based purification of a recombinant IgM monoclonal antibody for cancer treatment. 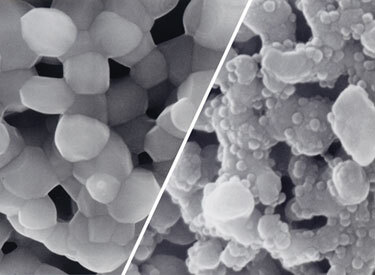 HA accomplished initial capture and reduction of aggregates to less than 1%, from an estimated 8–10% in the supernatant. HA has also been used effectively for virus purification, including bacteriophage, adenovirus, coronavirus, and Japanese encephalitis virus. Yae Kurosawa from the Pentax Ceramics division of Hoya, talked about research on HA purification of Dengue virus that was conducted with colleagues at Tokyo Metropolitan University. Contaminating proteins and DNA eluted before the virus and were eliminated in a single step. Average recovery of infectious virus particles was greater than 75%. This is extraordinary in comparison to traditional filtration-centrifugation procedures that seldom achieve recoveries greater than 15%, and highlights the potential of chromatographic purification to reduce vaccine production costs. Strong HA binding of lipid-enveloped species such as Dengue is expected. Envelope phosphate residues should interact strongly with HA calcium, and envelope calcium residues should interact strongly with HA phosphate, even at high NaCl concentrations. Research with other virus species demonstrates that HA can achieve binding capacities of up to 1013 particles per mL. These results suggest that HA could prove to be an important asset in global efforts to meet rapidly growing and diversifying demands for vaccine production. One of the key features of a mature manufacturing technology is that it has been well characterized for its ability to remove virus from therapeutic protein preparations. In this regard, the effectiveness of HA parallels its utility for virus purification. Hannelore Willkommen, vp of regulatory affairs for NewLab Bioquality, talked about virus reduction by HA and other methods in the purification of various recombinant protein therapeutics. As expected, HA reduction of lipid-enveloped viruses was dramatic. Infectious bovine rhinotracheitis virus and xenotropic murine leukemia virus were reduced by up to 6.5 and 7 logs, respectively. Reduction of several small nonenveloped virus species ranged from 1.8 to 4.3 logs. A recent publication by Snyder et al., has further shown that the presence of polyethylene glycol in HA buffers enhances reduction of both enveloped and nonenveloped viruses by an additional fivefold. HA’s increasing popularity naturally raises the question of how it might be improved. Shintaro Kobayashi from Hoya, presented a synthesis procedure that produces highly spherical particles with a narrower size distribution than spray-dry particles. By whatever process particles are initially produced, making them ceramic involves sintering at elevated temperatures. Sintering temperature determines porosity and surface area per unit volume. Larry Cummings, consulting scientist at Bio-Rad Laboratories, showed that particles sintered at 500°C support higher IgG binding capacity than particles sintered at 400° or 700°. Another variant, sintered at 950°C proved to be the best suited for Dengue purification. Chemical modifications of HA were also discussed. Replacement of HA hydroxyls with fluoride creates fluorapatite, which is physically stronger than HA and can be used at pH values as low as 5.5. Phosphoryl cation exchange on fluorapatite is equivalent to HA but the relative contribution of calcium affinity is lower. Tsuneo Okuyama, emeritus professor at Tokyo Metropolitan University, showed that polyethylenimine can form stable complexes with HA phosphate, effectively cancelling out HA’s cation exchange function and leaving a calcium-dominant surface. This surface binds phosphorylated biomolecules more strongly than native HA, and in some cases offers improved fractionation, offering new capabilities in the fields of proteomics, plasmid and virus purification. Yukiko Murakami of Hoya discussed the ability of zinc apatite to bind his-tag proteins. This approach avoids the nickel toxicity and hazardous waste disposal issues that burden IMAC, she said. HA exhibits no detectable change in performance after 15,000 hours in 1 M sodium hydroxide, but it does not tolerate exposure to chelating agents, which remove calcium from the structure. Neither does it tolerate acidic conditions, which gradually dissociate the matrix. The latter point is a potential concern when, as noted by Dr. Carta, pH descends in response to the introduction of NaCl. Salt-dependent pH transitions can be reduced, though not eliminated, by buffers such as MES. Scientists from Bio-Rad reported that including micromolar calcium in millimolar phosphate buffers ameliorates the effects of low pH and may help to extend column lifetime beyond 50 cycles. pH excursions are negligible when HA is eluted exclusively with phosphate. With its binding and elution mechanisms now generally understood, and its physical limitations largely resolved, HA has become a mainstream industrial tool, poised to fill an expanding role in the field of bioseparations. Although we understand how HA works on a general level, a detailed map of the HA binding surface and the fine points of how various surface features of biomolecules interact with HA remain vital research objectives. Maximizing capacity, separation performance, and column lifetime through media innovation and refinement of maintenance procedures represent equivalent priorities, especially for industrial applications. With continuing development in these areas, scientists can expect to witness steady progress toward realization of HA’s full potential. Pete Gagnon (pete@validated.com) is a downstream process development consultant and member of GEN’s editorial advisory board.